I had a natural father who encouraged me to pursue my dream. That story is here. I never realized what a gift my dad was until hearing the stories of broken families and the shipwreck it leaves in personal identity. God can reverse all that, but it’s not magic, and it often takes a spiritual father. The second motive for touching this topic is reformation. We are in the early stages of another reformation. The first one changed minds and gave access to the presence of God. The fruit was a renaissance that revolutionized the arts and an industrial revolution that changed cultures and living standards around the world. This reformation will be even bigger because it targets hearts with an invitation to work with God. It targets what God can do through you. The brilliance of this reformation is that it includes you. People don’t need to be convinced that they are invited into this move. Something is already stirring in their hearts, and they want to know how. The genius of Kingdom is not that we’re on our way to heaven when we die. Our assignment is bringing heaven to earth while we’re here. The goal is blessing and discipling entire nations. Finding my role starts with the belief that I have one! How can I help people step into their own heart and destiny? How can I become a father to others? It’s an ageless process. Fathers are not always older. They are ones who can listen to a heart and see what is written there. Sticking your nose in – Most of us have tried to intervene, gotten slapped and promised ourselves to mind our own business. If we impose a solution or an agenda on sons and daughters, we’ll usually earn the rejection we fear. Accountability is not a word that conveys the spirit of being a father. Fathering starts with listening, not just to the person, but to their hearts. Most people don’t know what’s in their hearts or can’t discern if what they do have is legitimate. Helping them discover what you and they don’t yet know is a prophetic process that doesn’t come out of a can or a program. When we do touch something God wrote in their hearts, it resonates. What always surprises me is that if I can help them connect with their hearts, they love me. It’s usually the first time anyone listened to them, and it’s usually the first time anyone helped them listen to what their heavenly Father has for them. Does God even know where I live? – Life has enough trauma that sons and daughters usually think God must be in New York City because it doesn’t feel like He’s here! When we touch the theme of what is written in their hearts, we’re confirming how much God knows them, knows about them and loves them. It’s an experience! Initiative – Knowing what God wrote in someone’s heart is sacred and exciting. The revelation of what to do transitions naturally to the wisdom of how to do it. Wisdom and initiative are partners in implementing what God wrote in our hearts. 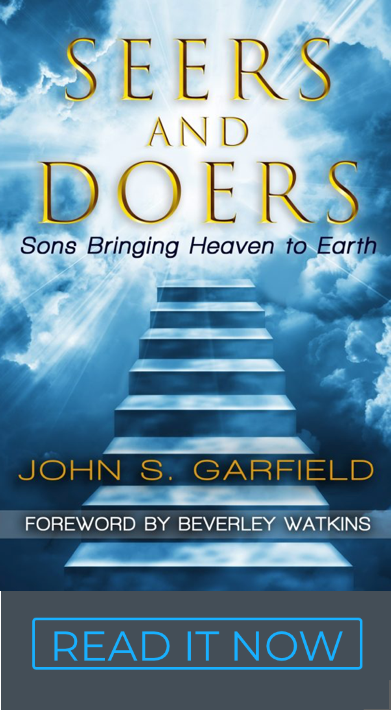 Fathers are positioned to encourage their sons to step into the enterprise and the ingenuity of the dream. Risk is something we manage, not avoid. Setbacks – Father’s realize that when sons first get out of the boat and walk on water, they often sink! Wisdom is about two-thirds learning from mistakes and resurrecting to try it again. Helping sons realize that they won’t lose their identity or their dream if they make a mistake is a huge ingredient. Good fathers usually walk with the limp of their own deaths and resurrections. It shows in the sense of brokenness and humility that can’t be faked or preached or learned; it can only be experienced. Father God – The most important things fathers do is show their sons how to access the presence and power and person of God. We wrote Seers and Doers for this very reason. This video with Gabor is an example of the fruit. They don’t want us looking over their shoulder all the time. They want an available relationship from someone who esteems them from an understanding of what they carry. Sometimes they will initiate conversations and sometimes we will check in to see how their heart and dream is doing. Those occasions of touching hearts may or may not be frequent, but they are a river of life. Releasing the hearts and dreams in sons and daughters is probably the greatest kingdom expression of reformation we have. Those relationships supersede every other approach to discipleship we’ve tasted or given. There’s more on this topic here.